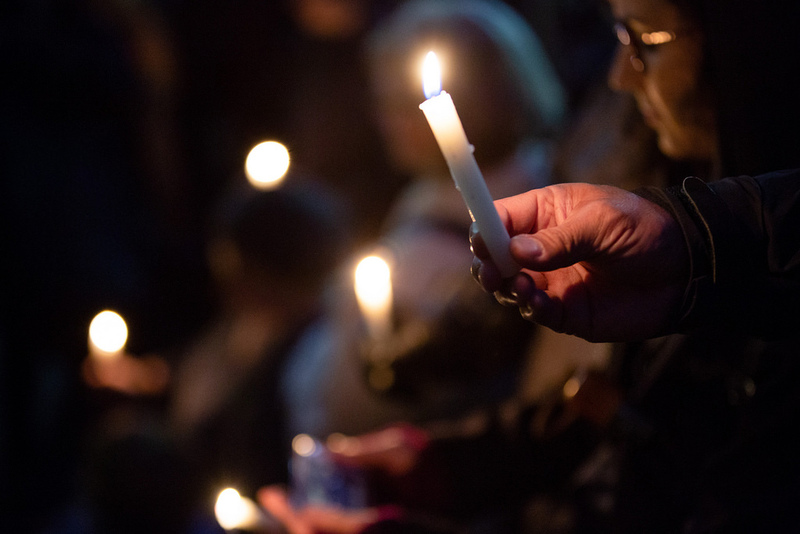 Pittsburgh residents hold a vigil to mourn the 11 worshippers killed at the Tree of Life synagogue. Three hate crimes in three days have left 13 dead. Many people are outraged, but not necessarily surprised by the spate of bomb threats nationally and fatal shootings in Pennsylvania and Kentucky. One shooting suspect who was unable to get past locked doors at First Baptist Church in Jeffersontown, Ky., went instead to a nearby Kroger on Thursday afternoon. He allegedly shot a man inside the supermarket and a woman in the parking lot, according to the police department. Both victims and most members of the church are African-American. In Pittsburgh, a man was arrested in the shooting deaths of 11 congregants attending a Saturday service at the Tree of Life synagogue. A third man has been charged with sending at least 14 bombs to Democratic opponents of Donald Trump, including President Obama and Hillary Clinton, as well as to CNN. None of the bombs detonated, and no one was injured. Reporting by Jenae Addison, Evan Brooks, Jasmine Harding, T’Keyah Hayes, Tiffany Hoyd, Nicole Hutchison, Maya Reese and Sonya Springer.